Every year for the past seven years I have looked forward to October and reading Star Trek® short stories by the very talented, very smart fans of the shows. I have often said that as a Star Trek fan, I have the best job in the world, and the hardest. And again this year, that proved to be true. I had to pick just twenty-three stories out of the boxes and boxes of wonderful stories that poured into the contest. The wonderful part was reading them all, the hard part was picking just twenty-three. But now this book of stories is in your hands, and I need help from all you Star Trek fans out there. I need you to write one or two or three or more Star Trek short stories, following the rules in the back of this book, and send them in by October 1, 2004. Why am I putting out a call for even more stories than I normally get? Simple. Many of the fans who have been sending me stories and trying to get into this contest for the last six or seven years have sold too many stories. This contest, by its rules, has a limit of only three professionally published short stories by the deadline of the contest. That's why you might see the same name two or three years running, or scattered over the years, and then that author is disqualified from sending in any more. As you might have noticed, many of them are still writing Star Trek, only over in the novels. Authors like Ilsa Bick, Dayton Ward, Christina York, and others. They started here and then eliminated themselves with too many sales, leaving room for new writers to join the fun. On a few Star Trek boards in different locations, people have pointed out to me this year that a very large number of the writers I have bought once or twice can no longer be in the book again. And this includes this year's Grand Prize winner, Julie Hyzy, who has been sending in stories regularly for five or six years now. She and many others have "graduated," as they say on the boards. And as an editor, that scares me, which is why I need all of your help. Come on, haven't you been watching an episode, seen a detail, and thought, "Wow, that would make a wonderful story?" Well, I need you to write that story this next year and send it in. I give every story the exact same chance at being in the book, and if you write a great story, it will make it in. What kind of stories am I looking for? My best suggestion on that question, which I get a lot, is to read this volume, and then go find copies of the previous volumes of this anthology. 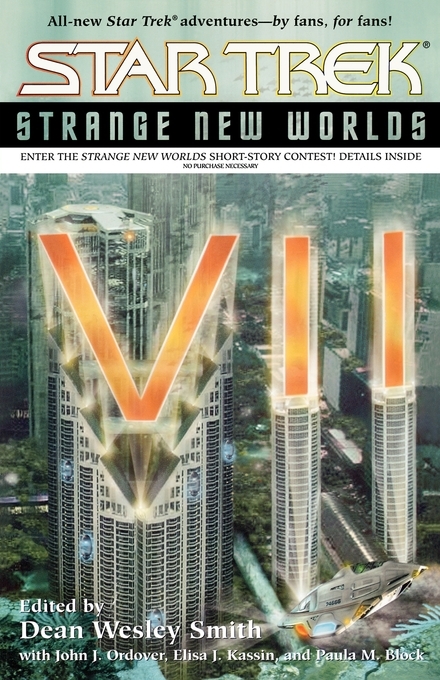 Not only will you have a wonderful reading experience, but by the time you are done reading all seven of the books, you will have a very good sense of the stories that have made it into Strange New Worlds over the years. So pass the word. Tell other Star Trek fans that the cutting edge of the Star Trek world is right here, in the short stories in these volumes, stories written by fans like you. Tell your friends, tell the other members of your starship crews, maybe challenge other writers in your writers' group, then sit down and write a story or two and send them in. You'll discover that the writing is a lot of fun, and if one of your stories makes it into the book, you'll have added to the Star Trek universe and be a Star Trek author. And trust me, the only thing more fun than reading Star Trek is being a Star Trek author. This is your chance. Enjoy the reading, then get to the writing.